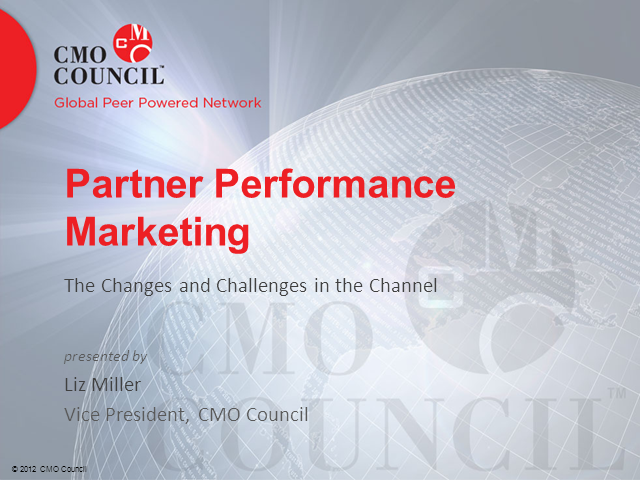 Includes exclusive CMO Council sneak preview at partner performance marketing study results. The Chief Marketing Office (CMO) Council's 6,000 members control more than $300 billion in aggregated annual marketing expenditures and run complex, distributed marketing and sales operations worldwide. In total, the CMO Council and its strategic interest communities include over 20,000 global executives in over 100 countries covering multiple industries, segments and markets. The CMO Council has started the new year with a peer based, thought leadership initiative aimed at furthering best practices in what it calls “Partner Performance Marketing” (PPM). Based on extensive interviews with senior- and mid-management partner marketing professionals, the study analyzes how leading brands are navigating the challenge of gaining channel mindshare, maximizing partner participation in cooperative marketing campaigns, as well as maintaining brand governance and message consistency in the field. With more technology buyers self-educating their purchasing decisions over the Web and devices, there is a need for OEMs, ISVs, distributors, system integrators and solution providers to adapt their marketing strategies for the "now" to include social, multimedia and mobile components which can be scaled and implemented at the local level.